What comes to mind when you think what is excellence? Images of medals from the Olympics or World Championships? Oscar and Grammy awards? Nobel prizes? Maybe the individuals who have won these lofty awards? Or maybe you think of the near-perfection of a piece of art, like the Sistine Chapel? Or the superior workmanship of a luxury vehicle or watch? Those images can make the concept of excellence seem pretty intimidating. Something only a select few who were blessed at birth with an extraordinary talent can attain. But what if I were to tell you that excellence was within reach of every single person on earth. That pursuing your own personal excellence has the power to transform your life? Because that’s exactly what I’m going to convince you of in the rest of this article. Hopefully you’ll get fired up to begin taking the first steps on your personal journey to excellence. However you define it for yourself, there are a few qualities of excellence that most people would generally agree on. Striving for perfection is about setting a goal or standard that by definition is impossible for a human to achieve. In contrast, excellence is about striving for a high-but-reachable goal or standard of performance, and progressively increasing that standard as our capabilities increase. That gold-medal moment on the podium at the Olympics isn’t excellence. It’s the result or reward of an athlete’s commitment to excellence day in and day out, for years, or even decades. Excellence is about the process. Giving your 100% best effort every day, not just when it’s easy or convenient, or when you’re feeling revved up and motivated. Consistency is critical. It’s devotion to a continual process of improvement, to being better today than you were yesterday. Then finding ways to be even better tomorrow and the day after that. It’s a no-coasting, no excuse zone. In his book “In Pursuit of Excellence,” sports psychologist and performance expert Terry Orlick, PhD, describes the key components of excellence as: focus, commitment, distraction control, ongoing learning, positive images, mental readiness, and confidence. Within specific areas, such as a career field, relationships, or health and fitness, there are obviously additional specific skills and habits that contribute to excellence, but each of these elements can also be developed and refined with practice. Now, you may be thinking that all sounds great, but it probably also requires a lot of hard work. And obviously, a commitment to excellence requires more intentional effort than drifting along the river of “good enough”. But does it actually require more work? It depends. If you spend most of your time in front of the TV, or just hanging out, pursuing excellence will likely require a bigger investment of energy. However, a lot of people already work really, really hard, yet they don’t get the results they want because a lot of that energy is unfocused, or they’re repeating ineffective patterns and behaviors, or their skills have plateaued. To top it off, they often waste a lot of energy dealing with the undesirable consequences of those patterns. Developing the habits of excellence will require an initial investment of energy, but once those habits have become ingrained, the actual level of work may not be any higher than what you’re already putting in – and your efforts will be more focused, productive, and fulfilling. And then there’s the question, is pursuing excellence really worth it? What does it get you? If you dream of breaking free from the chains of “ordinary” and breaking into the realm of an extraordinary life, whatever that means to you, pursuing excellence is probably the most surefire way of getting there, and perhaps more importantly, staying there. Committing to excellence will allow you to fully tap into your unique gifts and talents, and become the very best possible version of you. Learning and practicing skills related to communication and conflict resolution and setting healthy boundaries, while adopting the habits of people who have amazing relationships, can dramatically improve your experiences with your significant other, your children or parents, your friends, and your colleagues. Adopting healthy eating and exercise habits, and integrating practices like meditation, can increase your fitness and energy levels, your ability to concentrate, and your general health, giving you the ability to accomplish the things you want in all of the other areas of your life. Does excellence prevent bad stuff from ever happening? No, of course not – economies tank and companies go bankrupt, accidents and illnesses can still happen, and other people can behave in ways that have a negative impact on you. Stuff happens in life. Excellence isn’t a magic pill that protects you from everything. But, it increases your resiliency and your resources to deal with the bad things outside your control when they do happen. Pick one area of your life where you’d like to see an improvement or a change. Now, what is one thing that you could do better in this area? Maybe it’s a skill you could improve, or a new skill you could learn. A course you could take to be better at your job. Or developing the habit of expressing appreciation, or asking for help. It could be cutting back on processed foods, or eating more fruits and vegetables. Drinking more water, or creating time in your schedule for exercise. Once you’ve mastered that skill, or made the habit such an integral part of your life you can’t imagine going back to your old way. Ask yourself the same question again, and repeat the process. I’d love to hear about your results! Susan Peck, PhD is a professional life coach and founder of Call To Excellence Life Coaching, who specializes in helping people going through transitions (such as burnout, divorce, retirement, empty nest) re-envision and reinvent their lives to create an extraordinary life they love. 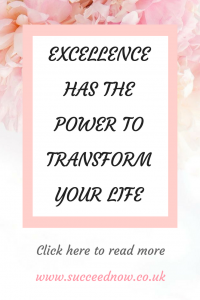 You can find more tips on how to integrate the habits of excellence into your life (and follow her real-time “Excellence Experiment”) on her blog, or by connecting with her on Facebook. For me, excellence has always been one of those elusive ideas that I could never fully grasp. I feel like I have a much better understanding of it. Now I just have to get to the action part. I liked your defination of excellence which states that it’s a gradual result of always striving to be better. I will take your challenge and try to improve one of my skills. I love the idea of always doing my best. Reframing the definition of excellence – to be improve progressively by your own standard as opposed to another’s, is key! Redefining excellence allows me to increase my comfort zone within my own pace getting better and better each time I attempt something. Not only does this diminish the comparison game but iomprve personal growth placing me against my own personal best. Thanks for adding value and raising consciousness!! all good tips! it’s hard to always stay motivated to strive for excellence but I definitely try my best!